On my last day in this beautiful place, I’ll be going solo. Erika is working most of the day so I decided to make my way this morning to one of Bermuda’s oldest treasures: Gibb’s Hill Lighthouse. After a mile hike uphill, I arrived at the 162-year-old landmark. About $2.50 gains you access to the spiral staircase of 182 steps, so I set off (sans inhaler) and crossed my fingers. Once I reached the summit, I was floored at the breathtaking views of the island. 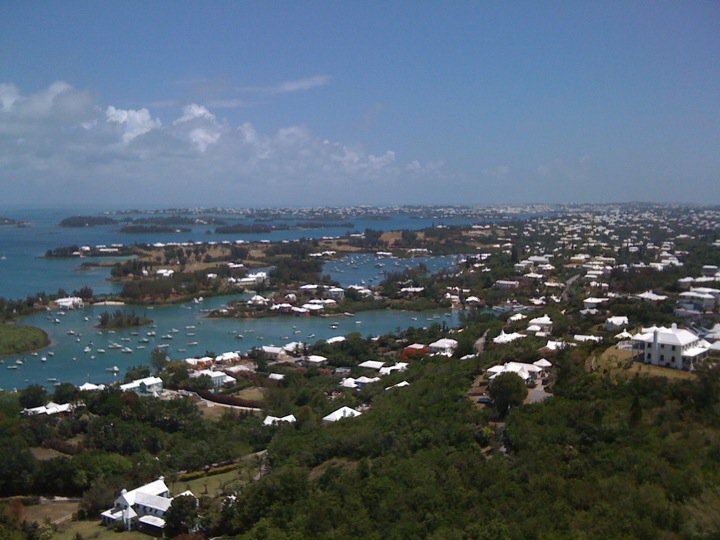 One can see almost the entire stretch of Bermuda from the Royal Naval Dockyard at the far west to just a hint of St. Georges parish at the far east. Phenomenal can hardly describe the scene. A lush landscape of palm trees and hibiscus flowers was set against a breathtaking backdrop of expansive blue ocean. I was all alone up there except for a pair of Mormon missionaries, but stayed there for a long time reflecting on the awesome scene in front of me. After exploring the lighthouse, I decided to spend my last sunny afternoon solo in the sea. An hour later I was lying starfish-style in the middle of the Atlantic Ocean, drawing in deep breaths of salty air when I failed to notice I was floating straight into the path of a Portuguese Man of War. Even though we’d seen signs posted around the beach warning tourists about the potentially deadly creature, neither of us had spotted any in the days leading up to this. Thankfully, a Good Samaritan couple shouted a warning before I backed right into the jellyfish’s camouflaged tentacles. Disaster averted. Once evening fell, Erika and I made our way to the Bermudan commissioner’s home for the conference’s closing cocktail reception and gala dinner. That’s where we met the Gombeys, an Afro-Caribbean dance group who perform to the sound of drums and whistles. Think tribal rave. These guys were decked out in elaborate masks with colorful costumes and wore peacock feathers atop their heads as they made their way through the crowd. The commissioner’s “home” is actually a museum dedicated at the time of our visit to the slave trade. 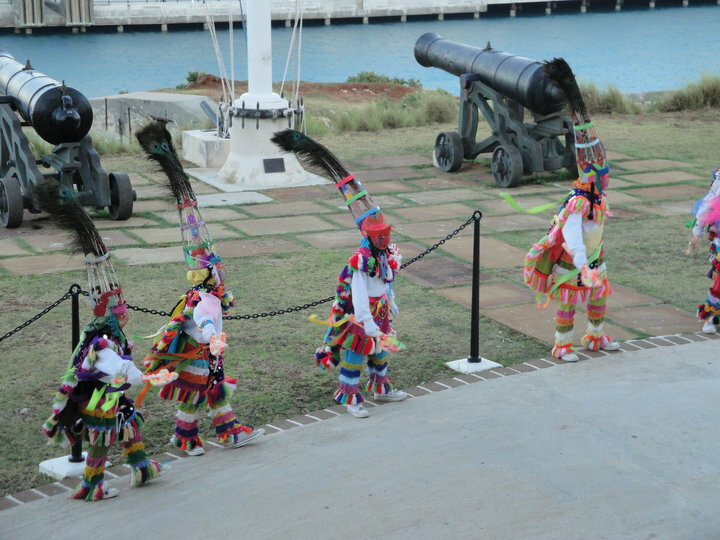 Hundreds of thousands of West African slaves were brought to Bermuda in the 17th Century and those slaves, seeking respite, organized the Gombeys. When the men were granted rest from work on holidays, they celebrated their short taste of freedom with dance. It was a pretty amazing thing to see in action. Later that night, we did a little dancing of our own back at The Cellar in celebration of our last night in Bermuda. I was sad to leave our hotel the following morning, but also ready to be back on the right side of the road again after the tumultuous car ride to the airport and subsequent delay. As luck would have it, a Bermudian security guard steered us away from U.S. Customs and into the wrong terminal, where we sat unknowingly for an hour before someone pointed us in the right direction. Thankfully, a few hours later, we were back on American soil. And ya know, no matter where in the world you travel, there’s something oddly comforting about seeing that uniformed American official welcoming you home. Mopeds zoom around every corner around here, but we’ve been warned that they’re a dangerous option for tourists who aren’t accustomed to driving on the left side of the road. By law, motorists are not allowed to go any faster than about 35 miles per hour, thanks to the extremely narrow streets. The concierge told us today that she’d recently been ticketed for going 35 in a 15 mph zone and is expected to pay a fine of $500! Lawd! We’ll stick to the trolley. Say what? Pump it up. Drink it down. The island has no rivers, streams or reservoirs so all the drinkable water here comes from rain. Bermudan roofs are painted with a limestone wash that purifies the water as it trickles down into underground tanks. Electric pumps send the water up to the tap to drink. It’s got a bit of a chemical taste to it, too. Better stick to rum. I ran into this funny guy today in Hamilton. He told me his name is Samuel Clemens. Apparently, he wrote a few books. This morning, my friend and I hopped on the blue trolley to Waterlot. 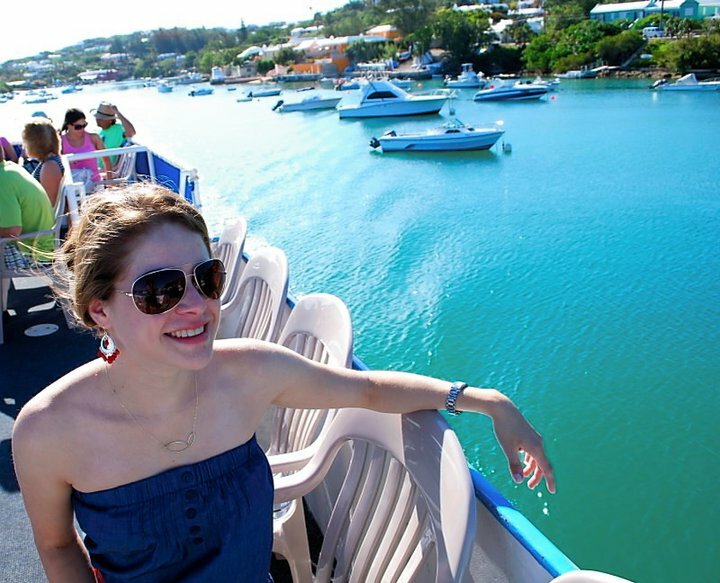 Only a 5-minute ride from the hotel, Waterlot is a local steakhouse, but more importantly, it’s where the boat dock and ferry is located. We took the 9 a.m. ferry 20 minutes to Hamilton — the capital of Bermuda and the center of Parliament – where we had a look around City Hall and the art gallery it houses. After lunch at the local diner, we walked across the street to the Anglican Cathedral of the Most Holy Trinity for a quick look inside the 100-year-old church. The sanctuary and organ were enormous, so Id’ have to agree that the “most holy” moniker was certainly appropriate. Also located in Hamilton is one of the main distilleries for Bacardi, Inc. The well-known liquor is used to make the famous little rum cakes sold all over the island. Next, we hopped the ferry back to Southampton and walked over to Horseshoe Bay, locally known as the “mother of all Bermuda beaches.” It proved to be a gorgeous stretch of sand and surf with numerous individual coves for those who prefer a more … private experience. Needless to say, we left all the lovebirds to their own devices and booked it back to the hotel to rest. After a long day of exploration and a whole lot of sun, we enjoyed dinner at Bacci, a lovely local Italian place down the road. I indulged in the spaghetti de mare, chock full of tasty lobster, shrimp, clams and mussels. Best part of the day. Shellfish make this girl very happy. Native to Bermuda is the whistling tree frog. The little creatures come out at night to regale us with a piercing chorus that sounds an awful lot like a home alarm – surprising for a creature no bigger than your thumbnail. Say what? Shipwrecks on deck. Bermuda is surrounded by at least 53 shipwrecks, a few of which are only half-submerged. Snorkelers, rejoice!